Ironically, the shortcomings of Tribes highlight why you must read these 150 pages. The book contains no table of contents, no chapters and no index. Its structure evokes that of fiction, rather than non-fiction. But even a good collection of essays contains a referential index and thematic clumps (a.k.a. chapters). In lacking this structure, Mr. Godin leaves the reader wanting more (hence, the MSG metaphor). But, it is this very lack of structure that he so strongly advocates for the organizational realm. Hierarchy, he implies, stultifies the creativity needed to successfully compete in global markets. His clarion call to all: upend the status quo. By incorporating a bit of chaos in Tribes, the writer shows by example both the yin and the yang of his philosophy. I can best describe Tribes as a series of interesting and, at times, inspiring, anecdotes. If you’re looking for a how-to manual, Tribes doesn’t fit the bill. Mr. Godin does tease, though. Under the heading “Tactics and Tools for Tightness” (pages 53-55), he offers specific web-based devices you might employ to create your own tribe. Further along (pages 102-105), beneath the banner “Your Micromovement,” he outlines specific steps. The author calls them “five things to do and six principles” but I can understand why some might label them mere platitudes. Realistically, though, if you want a practical hands-on guide, I would recommend both twitter power by Joel Comm and, especially, The New Rules of Marketing & PR by David Meerman Scott. Had Mr. Godin provided more sustenance to his stories, Tribes might have been more filling. For example, he does an excellent job relaying the story of Nathan Winograd’s success in sparing the lives of healthy dogs and cats (see “Case Study: No Time to Kill” pp 141-145). 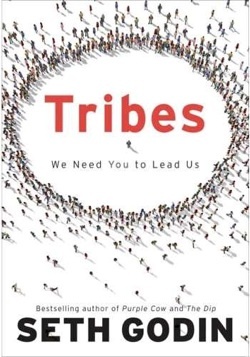 Yet, while he alludes to the power of assembling the tribe in that success, he fails to specifically explain how Winograd (and his mentor Richard Avazino) created the tribe in the first place. The author leaves the reader alone to wonder. More significant to the for-profit audience, Mr. Godin, while citing many commercial successes, does not offer the answer to the critical “how exactly did they do it” question. For example, he states (on page 49) chef David Chang uses a blog to drive eaters to his restaurant. But how did he build that base? Did it drip over time? Did he have a paper newsletter first? Did he initially build a Twitter following? Too many of these real-life stories appear to assume the audience already has some familiarity with the answer. Perhaps the author expects his fans to nod their heads knowingly when he brings up these references. Still, every movement needs a sound philosophical underpinning. Tribes accomplishes this wonderfully. If, after reading this book, you don’t have an urgent need to lead, to create, to find your own “Long Tail” (see Chris Anderson’s The Long Tail, then you may as well go back to your buggy whips and hula hoops.